Is NextPoint Residential Trust Inc (NYSE:NXRT) A Good Stock To Buy? How do we determine whether NextPoint Residential Trust Inc (NYSE:NXRT) makes for a good investment at the moment? We analyze the sentiment of a select group of the very best investors in the world, who spend immense amounts of time and resources studying companies. They may not always be right (no one is), but data shows that their consensus long positions have historically outperformed the market when we adjust for known risk factors. Is NextPoint Residential Trust Inc (NYSE:NXRT) a buy, sell, or hold? Money managers are in a pessimistic mood. The number of bullish hedge fund positions were cut by one recently, hence at the end of the third quarter, there were only nine investors with long holdings of the stock. Nine bullish hedge funds are far from enough for it to be considered as one of the most popular stocks in recent months. (If you are interested to see which public companies hedge funds have been piling on recently, take a look at the list of 30 most popular stocks among hedge funds in Q3 of 2018). In this article, we are going to examine NextPoint Residential Trust Inc (NYSE:NXRT) in more detail, and try to determine whether the stock is worthy of your portfolio. In the 21st century investor’s toolkit there are a large number of metrics stock traders use to analyze stocks. A pair of the most underrated metrics are hedge fund and insider trading moves. Our researchers have shown that, historically, those who follow the top picks of the best investment managers can outperform their index-focused peers by a solid amount (see the details here). In order to make our final call on the stock, we need to gather more data about it, which is why we will now take a glance at the recent hedge fund action towards it. What have hedge funds been doing with NextPoint Residential Trust Inc (NYSE:NXRT)? At the end of the third quarter, a total of 9 of the hedge funds tracked by Insider Monkey were long this stock, a change of -10% from the second quarter of 2018. 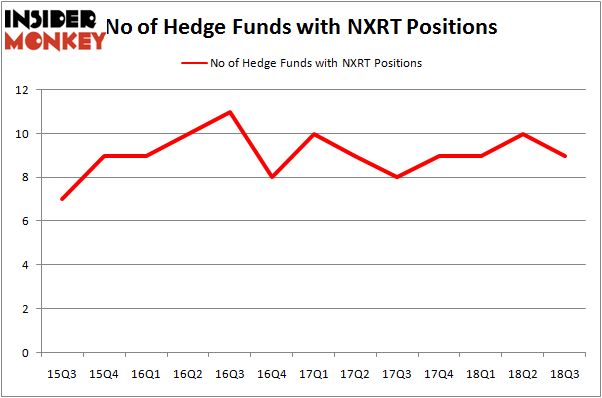 The graph below displays the number of hedge funds with bullish position in NXRT over the last 13 quarters. With hedge funds’ positions undergoing their usual ebb and flow, there exists a select group of notable hedge fund managers who were adding to their stakes substantially (or already accumulated large positions). The largest stake in NextPoint Residential Trust Inc (NYSE:NXRT) was held by Highland Capital Management, which reported holding $68.4 million worth of stock at the end of September. It was followed by Renaissance Technologies with a $39.5 million position. Other investors bullish on the company included Millennium Management, GLG Partners, and Lyon Street Capital. Due to the fact that NextPoint Residential Trust Inc (NYSE:NXRT) has faced bearish sentiment from the entirety of the hedge funds we track, it’s easy to see that there lies a certain “tier” of funds who sold off their full holdings in the third quarter. Interestingly, Emanuel J. Friedman’s EJF Capital cut the largest stake of the “upper crust” of funds monitored by Insider Monkey, valued at an estimated $0.3 million in stock, and D. E. Shaw’s D E Shaw was right behind this move, as the fund dropped about $0.3 million worth. These bearish behaviors are intriguing to say the least, as total hedge fund interest dropped by 1 fund in the third quarter. Let’s check out hedge fund activity in other stocks similar to NextPoint Residential Trust Inc (NYSE:NXRT). We will take a look at Vantage Energy Acquisition Corp. (NASDAQ:VEAC), Frontier Communications Corporation (NASDAQ:FTR), Cellcom Israel Ltd. (NYSE:CEL), and Cohen & Steers Limited Duration Preferred and Income Fund, Inc. (NYSE:LDP). This group of stocks’ market values are similar to SNY’s market value. As you can see these stocks had an average of 10 hedge funds with bullish positions and the average amount invested in these stocks was $96 million. That figure was $136 million in NXRT’s case. Frontier Communications Corporation (NASDAQ:FTR) is the most popular stock in this table. On the other hand Cellcom Israel Ltd. (NYSE:CEL) is the least popular one with only 1 bullish hedge fund position. NextPoint Residential Trust Inc (NYSE:NXRT) is not the least popular stock in this group but hedge fund interest is still below average. This is a slightly negative signal and we’d rather spend our time researching stocks that hedge funds are piling on. In this regard FTR might be a better candidate to consider a long position. Is Ulta Beauty, Inc. (NASDAQ:ULTA) A Good Stock To Buy? Hedge Funds Are Dumping C.H. Robinson Worldwide, Inc. (NASDAQ:CHRW) Is Old Dominion Freight Line, Inc. (NASDAQ:ODFL) A Good Stock To Buy? 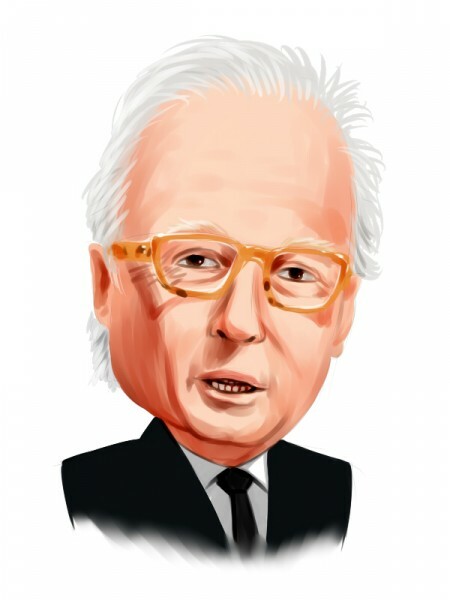 Billionaire Ken Fisher is Betting Big on this Japanese Banking Giant Hedge Funds Are Underwhelmed by Sanofi (SNY)’s Growth Prospects Is It Time to Follow Hedge Funds Into BP p.l.c. (BP)?